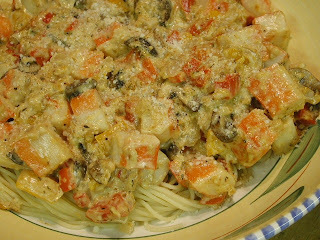 I found an interesting recipe over at Presto Pasta Night at Once Upon a Feast: Cajun Shrimp Spaghetti with Cream Sauce. Maybe not so much on the "healthy" with the cream sauce, but tasty and quick to prepare and using the half and half rather than cream does cut the fat content. There are lots of veggies in the sauce: mushrooms, bell peppers, onions. I used some leftover crab meat I had rather than shrimp. It was fine but I think next time I'll go with shrimp. I went a little light on the Cajun seasonings and next time I'd definitely add more. I like my Cajun with a kick. ;-) A loaf of artisan bread from Trader Joe's and a bagged salad and you have dinner on the table in about twenty minutes! Recipe from Elly at Elly says Opa! Heat the butter over medium heat in a skillet. Sprinkle the shrimp liberally with Cajun seasoning, and then saute in the pan for 1 minute per side (you are not cooking it through here). Remove with a slotted spoon. To the skillet, add the onions, peppers, mushrooms and garlic. Saute until the vegetables are tender. Add the flour and stir it for a minute or two, to cook off its rawness. Add the half and half and stir, thickening. Put the shrimp back into the skillet to cook through. Season to taste with salt and pepper (and more Cajun seasoning, if desired). Toss with hot pasta and serve.